It's coming up to that time of year again, Christmas! 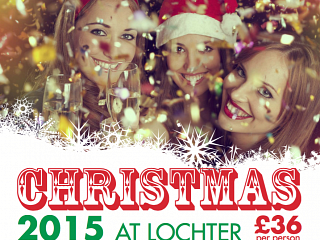 We are holding lots of Bring a Party to a Party nights at Lochter. The evening starts at 7pm, with a 3 course meal followed by dancing to DJ Jasper and finishing at 1am. See our poster HERE and our evening menu HERE for further information. We are also able to host Christmas lunch events, please find the menu HERE. If you are interested in booking a lunch or evening event, please call Aileen or Michaela on 01651 872000 for further information and availability. Have you got your Christmas Party organised yet?